We came up with a twelve pack recipe list that is sure to help add a little extra holiday cheer in your meal prep this season. Cooking with craft beer not only adds complexity and character, but helps boost the depth of flavors already present in your dishes. And, believe it or not, it also provides some added health benefits. The hops and malt in beer contain healthy antioxidants. Plus, the great thing about cooking with beer is that there are endless opportunities for experimentation and adjustments to suit one’s own preferences. The fruity and citrus flavors derived from hops in many light beers will accentuate the flavors in chicken, turkey, or seafood dishes, while malt-forward ales, stouts, and porters are best suited for beef, pork, lamb, or stew. Get the party started with a fresh Lemondrop™ twist on Hawaiian-styled pulled pork. These pulled pork-stuffed buns will surely be a hit as both an appetizer or snack! Hopsteiner recommends: “Golden Thing” from Troegs Independent Brewing in Hershey, PA (8.2 ABV). Add a fresh lemonade and sweet citrus twist to the table with this Double IPA featuring Lemondrop™ hops. Impress your guests with your culinary skills by whipping up this unique cheese fondue featuring a delicious Belgian Wit. Hopsteiner recommends: “White Van” from Solemn Oath Brewing in Naperville, IL (4.7 ABV | 15 IBU). This dry-hopped Belgian Wit is bursting with an orange/vanilla creamsicle flavor that will be sure to add a kick to your fondue. You can’t have Christmas breakfast without bacon! This recipe requires only bacon, brown sugar, and a Stone Americano Stout. You can’t go wrong. Hopsteiner recommends: “Americano Stout” from Stone Brewing in San Diego, CA (8.7 ABV | 65 IBU). This stout is a coffee lover’s dream, pairing strong coffee notes with a taste of hoppy/malt persuasion. Add some flair to this classic dish by incorporating a complex winter ale into the recipe. Hopsteiner recommends: “Jubelale” from Deschutes Brewing in Bend, OR (6.7 ABV | 65 IBU). Jubelale was crafted for the community, bringing together bold flavors of roasted, spicy, dried fruits for winter holiday gatherings. Featuring Bravo and Delta hops, this robust ale is sure to impress, offering a warming spice with every sip or bite. 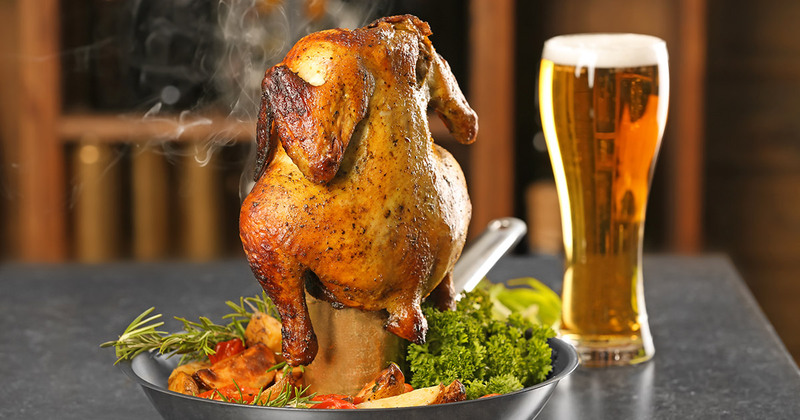 It’s exactly what it sounds like; placing a beer can inside the chicken ensures the moisture is retained and adds a unique fruity flavor from hoppy esters. Hopsteiner recommends: “Always Ready” from Cape May Brewing Co. in Cape May, NJ (4.8 ABV | 23 IBU). Always Ready is a Northeast Pale Ale with tons of juicy pineapple, mango, and citrus zest from the Calypso and X06277 hops it was made with. Pairing great with any style of chicken. Already a delicious soup on its own, add some Kielbasa into the mix and you now have a main course! Hopsteiner recommends: “El Denali” featuring Denali (X06277) from Sactown Union Brewery in Sacramento, CA (6.5 ABV | 45 IBU). El Denali is a brand new Hazy IPA that offers a blend of juicy stone fruit and pineapple flavors. The dry body of this Hazy IPA will help accent the cheddar soup and complement the addition of a kielbasa. Have too much leftover turkey? Tired of turkey sandwiches? Grab a light lager and cook up some turkey chili. Hopsteiner recommends: “Solid Gold” from Founders Brewing Co. in Grand Rapids, MI (4.4 ABV | 20 IBU). This premium lager is brewed on the ‘attitude of no regrets,’ as it takes the highest quality ingredients and challenges the limits on ‘what should be.’ Solid Gold will enhance the most basic bird and help make those leftovers disappear faster than you can pull them out of the fridge. ‘Simple and delicious’ is the best description for this beef crock pot roast. And, letting it spend 6-8 hours soaking in delicious beer will only add to the depth of flavor. Hopsteiner recommends: “Skip Rock” from Summit Brewing Co. in St Paul, MN (4.5% ABV | 18 IBU). Skip the garnish and add Skip Rock to your next pot roast for a special twist on this winter favorite. Skip Rock offers notes of zesty citrus, clove, and biscuit from Lemondrop™ hops for a refreshing finish. This is the most common and popular dish to utilize beer – and for good reason. Beer battered fish can be prepared a number of ways, so add in your favorite beer and get cookin’! Hopsteiner recommends: “Lucy,” a session sour from Indeed Brewing Co. in Minneapolis, MN (4.2% ABV | 27 IBU) that features Calypso hops. Lucy adds the perfect amount of a tart, citrusy finish, with notes of lemongrass and orange peel. Light in body with lush tropical fruit and citrusy flavors from the Calypso hops will surly complement the natural flavor of the fish. Classic Mac and Cheese is already great. But add an IPA to the recipe and you’ve got something that will surely stand out. For you chocoholics out there, try this chocolate layer cake that uses a creamy stout to kick it up a notch. Hopsteiner recommends: “Backbone” from Boneyard Brewing in Bend, OR (6% ABV|20 IBU). This rich, creamy stout combines three of our favorite things (espresso, chocolate, and beer), which are all brought together to create a flavorful dessert. Satisfy your sweet tooth with some chocolate truffles and beer sugar with an oatmeal stout. You can incorporate beer into the sugary coating of the truffles for a unique take on the popular dessert. Hopsteiner recommends: A smooth, roasted “Oatmeal Stout” with a silky body for a perfect balance. This Oatmeal Stout from Upslope Brewing Company in Boulder, CO boasts a 5.0% ABV with 25 IBU. Notes of cocoa and hints of caramel make this beer perfect for pairing with or in any dessert.